Rainwater harvesting is a fantastic way to use natural resources to your benefit and to conserve water! With the environment constantly changing, we need to learn how to utilize what we have to make it last longer! By harvesting your rainwater, you can divert and store it for later use in a variety of ways. Captured rainwater is most typically used for landscaping, as the water is free of harmful chemicals and minerals and doesn't have to be treated before use. Stored rainwater is also a great way to provide water for local wildlife. In some communities, up to 50% of the total water supply is used for landscaping. If each of us began capturing and harvesting rainwater for our needs, the demand on our city and state water supply would drop drastically, saving the state (and ourselves) money and resources. 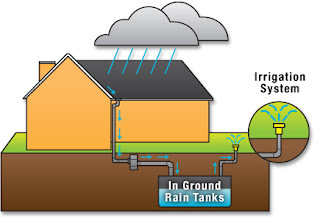 Storing rainwater also reduces run-off, erosion and contamination of our surface water. The benefits are endless and it just takes one phone call to GreenTeam to get started on YOUR rainwater harvesting project! Give us a call today!